A large celebration of the Coronation was held in Lake Meadows in 1953. 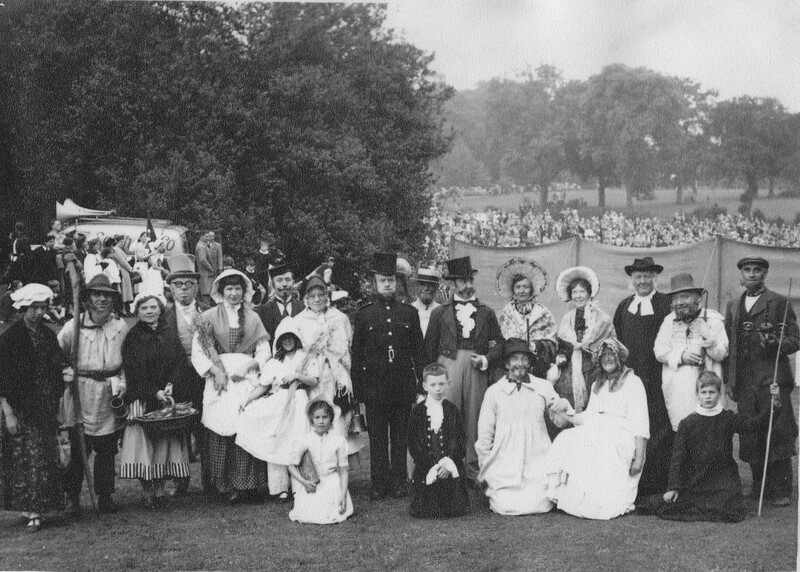 If you look at the photograph you can see large crowds the other side of the lake, The photograph is of a group dressed up to depict 19th Century Village Life. Miss Amos, Mr. Amos, Miss Crawford, Mr. Clarke, Miss Valerie Seaton and Mr. & Mrs Shepherd (with Mr. Shepherd dressed as the schoolmaster). In front of them there are two girls described on the back of the photograph as The Misses Amos. Next are Mr. Latchford (dressed as the Constable) and Latchford junior (dressed as a page), at the back in the boater is Mr. Cottis (the baker). We then have Mr. Higby (squire) and Miss Wood (wife) and Mr. & Mrs. W.S. Smith (Parson & Wife). At the front in white are Mr. Latchford (swain) and Miss Cohen (milkmaid) and finally in the back row are Mr. Taylor (shepperd) and Mr. Carpenter (smith). The boy at the front right is not named and is dressed as a choirboy kitted out for Beating the Bounds, is this you? Do you recognise anyone in the photograph or are they related to you. Add comments below if you know anything about the individuals or were at the event on the day. I just found this picture. The man in the back right is my grandad Tom Carpenter – he was the blacksmith at Little Burstead. And he is playing a smith – so appropriate. The Revd W S Smith was the Vicar of St Mary Magdalene Church, so is aptly cast. Mr Higby (if it is the same one) was Head of St John’s School.